Wayne Rooney scored a dramatic hat-trick as Manchester United produced another sensational late comeback to beat West Ham and edge closer to the Barclays Premier League title. United appeared certain to open the door for Arsenal and Chelsea when their defence went into meltdown, gifting the Hammers two first-half penalties which Mark Noble duly dispatched. The result moved United eight points clear ahead of Arsenal and Chelsea before their respective games, while dragging West Ham back into the drop zone on goal difference. Old Trafford boss Sir Alex Ferguson spent the build-up to today's game bemoaning refereeing decisions he claimed had gone against his side this season. But United got the rub of the green today, with returning captain Nemanja Vidic lucky to stay on the field when it was still 2-0. And the visitors showed they were more serious about today's game in the fourth minute when Robert Green was forced to tip over Chris Smalling's header from Ryan Giggs' fourth-minute corner. Noble sent Tomasz Kuszczak - in for the injured Edwin van der Sar - the wrong way and Upton Park erupted, but West Ham were immediately on the back foot again, giving United far too much time and space out wide. The visitors' frustration boiled over when Darron Gibson was booked for kicking out at Noble. Hitzlsperger blasted a difficult volley from Gary O'Neils' cross wide and although the visitors ended the half stronger, Vidic pressed the self-destruct button again when he hauled down Demba Ba three minutes from the break. The substitute almost made an instant impression when his improvised flick from Giggs' cross sailed over. Vidic could easily have earned a second yellow card after tangling again with Ba. Rooney, who had orchestrated United's good play in the first half began to look lost. Rooney came to the rescue again when Antonio Valencia's ball found him on the edge of the box and West Ham's defence allowed him to take a touch and fire low across Green. Fabio's skill left Matthew Upson on the deck and when the defender got back up, the full-back kicked the ball against his arm. 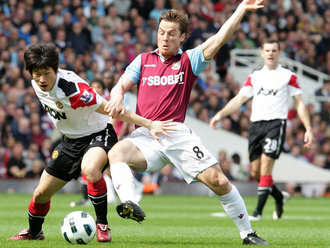 Gibson should have made it 4-2 before West Ham threw on Victor Obinna and Robbie Keane for O'Neil and Noble. Smalling survived another handball shout before Hernandez pounced on a piece of terrible defending six minutes from time to turn in Giggs' cross. Rooney was withdrawn for Nani as United comfortably saw out their latest fightback. West Ham: Green, Jacobsen, da Costa, Upson, Bridge, O'Neil (Obinna 83), Parker, Noble (Keane 83), Hitzlsperger, Cole (Piquionne 68), Ba. Subs Not Used: Boffin, Reid, Tomkins, Spector. Goals: Noble 11 pen, 25 pen. Man Utd: Kuszczak, Fabio Da Silva, Smalling, Vidic, Evra (Hernandez 46), Valencia, Gibson, Carrick, Park (Berbatov 64), Giggs, Rooney (Nani 87). Subs Not Used: Amos, Owen, Anderson, Gill. Goals: Rooney 65, 73, 79 pen, Hernandez 84.